The front-drive Sportage LX strikes us as the best value here, with standard features like satellite radio, a USB port, and Bluetooth--not to mention the best fuel economy of all. If you're going to bust the budget on the Sportage SX, choose navigation or UVO first, because they're still not both available on the same vehicle. A rakish crossover with a 260-horsepower four on tap, the Kia Sportage reboots its image on a few levels all at once. Wagons and minivans are fine for some families, but others need something in a more athletic style. The Kia Sportage fits that bill: it's a grippy, pert little hatchback that puts on some SUV airs when it needs to carry people and make it through foul weather. But it skips the whole live-axle, locking-differential fantasy world of loggers, swamp people, and anything truly involved in off-roading. It's the cosplay sport-ute--and it's great at it. The Kia Sportage slips easily into its work togs, like a size 7 foot into a Nike cross-trainer. 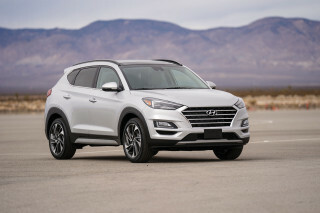 Bigger than in its first run around the neighborhood, the second-generation Sportage is still on the compact end of its class, and relatively unchanged for the 2013 model year, while it takes on other incumbents like the Chevy Equinox and Hyundai Tucson, as well as newer entries like the Ford Escape and Honda CR-V. The Sportage packs convenience and features into a body that's as much a hatchback as it is a trim little utility vehicle, and offers all-wheel drive for the few who really need it--and the significantly higher number of people who'll pay for it when they really don't. Spanning a price bracket from about $20,000 to more than $35,000, the Sportage crosses swords with those larger vehicles, but it does so with presence that's equally tough. The chunky, laid-back look owes a lot to the European hot hatches, but the high stance and slightly snubbed nose are pure ute, as is the rectangular, function-driven interior. Substance gets a workout all over the Sportage's sheetmetal and cabin, but there's an equal dash of style that's distinctive to Kia. Four-cylinder engines are all that's offered on the Sportage in this generation, and they're all that's needed, since one gets a turbocharged horsepower lift. 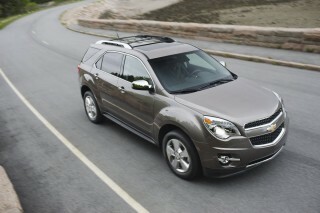 The base engine's a 2.4-liter four with 176 horsepower and direct injection. A six-speed automatic isn't the only gearbox, but its measured, responsive shifts are likely the only ones you'll find on dealer lots: we've yet to see one of the manuals. Opt for the turbocharged SX and the Sportage's output rises to a breathy 260 hp, enough to spin the front wheels a little before traction control mellows out the party, and the automatic gets shift paddles for less distracted driving and better response. All-wheel drive is an option across the board, and comes with a differential lock that splits power 50:50 at speeds up to 25 mph. In either trim, the base four-cylinder Sportage isn't quite as savvy at muting road surfaces as, say, a Subaru Forester. Ride quality's improved a bit this year with more sophisticated shocks on base versions, like those standard on EX and SX versions. Big 18-inch wheels don't help, so think twice before blinging out. Kia tunes its electric power steering systems on the heavy side, which gives them a little more realistic feel than its Hyundai cousins, and better control over minor road modulations. The SX makes great strides toward a truly sporty driving experience, something a little bit more tuning could bring home. With its wider footprint, the Sportage delivers more interior space than its ancestors, but it's still on the smaller side of crossovers. The front seats benefit from the relatively high dash, and have good leg and shoulder room. As usual, add a sunroof, subtract headroom. The seats themselves are well-shaped and can be air-cooled on high-line Sportages. The back seat's like that in the Tucson--bigger adults will slouch a bit to find a good seating position perched on the otherwise nicely angled cushions. Cargo space measures 26.1 cubic feet, more than some luxury utes, and the rear-end styling means more of the cargo space is hidden behind sheetmetal--great for valuables, not so great if you carry pets often. Standard curtain airbags and stability control are joined by optional rear parking sensors and rearview camera, which help with the Sportage's sizable blind spots. The IIHS calls the Sportage a Top Safety Pick, too. 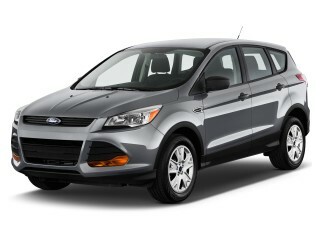 Standard features include air conditioning; power windows, locks and mirrors; and 16-inch wheels. Moving up to more expensive models adds features like keyless start; satellite radio; Bluetooth; steering-wheel audio and phone controls; and a USB port. Top models get a telescoping steering wheel; a cooled glove box; a power driver seat; 18-inch wheels; leather steering wheel and shifter trim; roof rails; and a rear spoiler. Major options include leather upholstery; seat heaters; a cooled driver seat; and finally UVO, Kia's version of the Microsoft voice controller sold by Ford as SYNC. Kia's version has a more limited vocabulary and controls fewer functions, but it can search all your media to find the perfect soundtrack to your next drive, whether it lives on your iPod, an SD card, or HD Radio. It's a trendsetter: the Sportage bridges the gap between sporty hatchback and mini-SUV better than almost anything in its class. Crossovers are getting better looking. We'll brook no arguments: we'll just point to the old Kia Sportage and this current generation as an example of how quickly design themes can change, and for the better. Today's Sportage is one of the coolest in its class, a hot little mashup of taut hatchback lines and the slightly elevated stance of an SUV. There's some tipped-back attitude on loan from the Soul five-door, too, and Kia's family grille cooking on the front end, headlights tucked in seamlessly along its sides. Kia's design team has picked a few details to highlight and left the rest on the drawing-room table, forgoing the clunky overdrawn-ness of something like a Jeep Compass for a cleaner take. The front end is particularly crisp, with a sort of elegant simplicity in the way the headlights and spoiler play with the reverse-bowtie blacked-out grille. The light sculpturing down its flanks makes the Sportage’s straight lines look even better in relief, too. The cockpit of the 2012 Sportage relates to the sheetmetal in a way most cars and utes gloss over. Big gauges are framed by a rectangular dash that's toned down significantly versus the one in the Tucson, though if you look hard, you can see how the two share some common hard points. It's workmanlike in the best way possible, with a substantial look and an authentic feel that's handsome at the same time. Hefty steering and a sometimes jittery ride are mild drawbacks, while the Sportage's refined powertrains work well for its size--especially the turbo four. Kia never had to downsize the Sportage, but along the way to its second generation, it gave up a hoary old V-6 engine in favor of a pair of four-cylinders--one turbocharged, one not. With either one, the Sportage has a heftier, more deliberate and better sorted feel than its Hyundai Tucson cousin, if only by a thin margin. But it has the turbo four all to itself, and as Robert Frost would argue, that has made all the difference. 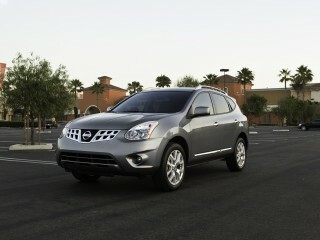 The stock four-cylinder in the Sportage is a 2.4-liter producing 176 horsepower. It's adequate in a positive sense, measured in its responses and perky enough in pushing its power through the standard six-speed automatic when it's a front-driver. The transmission's not stressed at all, and it's responsive enough in changing gears when it's moved to its manual-shift mode. Ticking the SX box on the Sportage's order sheet specifies a turbocharged 2.0-liter four, and lifts output to a breathy 260 hp. That's more than enough to overpower the front wheels a few rotations before the traction control cuts in on the dance. With the turbo also comes a set of shift paddles, for more natural driving response and less distracted operation. In either front- or all-wheel-drive guise, the Sportage falls a little shy of the ride and handling delights of, say, a Subaru Forester. The ride’s a touch rumbly, especially on the big 18-inch wheels offered on top trims. 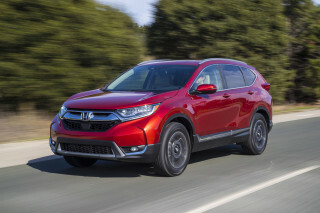 Ride quality tends to be a little stiff and jarring, compared to other crossovers this size; another downside is road noise, which can reach an ever-present rumble on coarse surfaces. Kia’s tuning of the electric power steering it shares with Hyundai is a bit better, with more dialed-in heft that muted some of the wandering you’d feel in a Tucson on the highway. Like the brakes, it gives up a touch of the controlled feel Subaru’s delivered in the nimble Forester. The cabin's roomy and finished fairly well, but the Sportage could do with less road noise. Larger than the first-generation crossover, this second-generation Kia Sportage still sits on the smaller end of the sporty crossover spectrum. But it does deliver more interior room than before, and nudges the likes of the Nissan Rogue with its seating space and cargo capacity. In front, passengers sit on well-shaped cushions upholstered in grippy cloth on most versions. When they're covered in leather, the Sportage's seats can also be ventilated and heated, a nice luxury touch in a vehicle that begins life so inexpensively. However, the passenger seat remains a manually operated piece, no matter how much you spend--even though a power driver seat is available. These front seats benefit from the Sportage's relatively high dash, and have good leg and shoulder room, with a fairly narrow space for knees, given the ute's overall size. As usual, add a sunroof, subtract headroom. The back seat's like that in the related Hyundai Tucson. Bigger adults will slouch a bit to find a good seating position perched on the otherwise nicely angled cushions. Cargo space measures 26.1 cubic feet, more than some luxury utes, but smaller than in most other compact crossovers. The rear-end styling means more of the cargo space is hidden behind sheetmetal--great for valuables, not so great if you carry pets often. AWD versions earn slightly better safety scores. 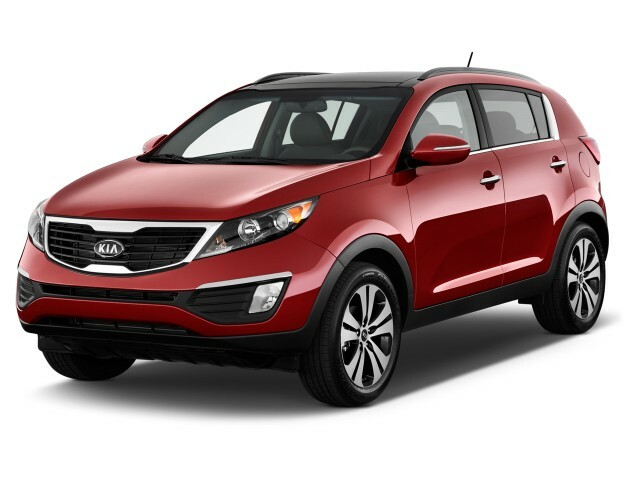 The 2013 Kia Sportage has plenty going for it with respect to safety. Its feature list is stocked with items that safety-minded folks in northern climates will appreciate--and it's achieved an excellent set of safety ratings. 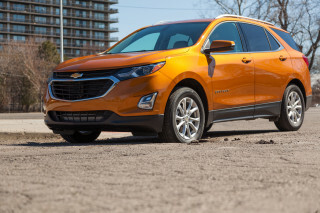 The National Highway Traffic Safety Administration (NHTSA) gives front-drive Sportages an overall score of four stars, while all-wheel-drive models earn a five-star score. The Sportage earns top 'good' ratings across the board from the Insurance Institute for Highway Safety (IIHS)—and it's earned the Top Safety Pick designation. Dual front, side and curtain airbags; anti-lock brakes; and stability control are standard in all Sportage models. In addition, they have standard hill-start assist and downhill brake assist, which aid and abet all-traction capability. Rear parking sensors and a rearview camera are available in option packages on some but not in all models. We recommend them, as there are some big blind spots and rearward visibility is s weakness. Base versions are great values, with standard Bluetooth and other convenient features; upscale models aren't as big a deal. Now the Kia brand's entry-level crossover, the Sportage doesn't lack the kind of features that make their way into the bigger Sorento. Almost all versions have more features and a lower sticker price than their most frequently named competitors, and EX and SX versions can be trimmed out to high spec--and high sticker prices, too. 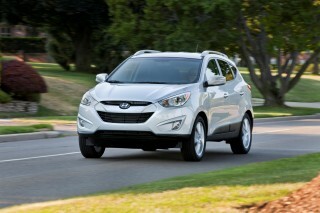 The generous standard-features list extends across all four Sportage models--from base, to LX, EX, and the sporty SX. 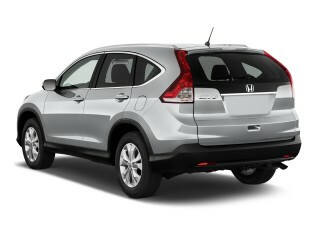 The under-$20,000 base crossover gets power windows, locks, and mirrors; 16-inch wheels; and air conditioning. The more expensive trim levels get telescoping steering; satellite radio; a USB port; Bluetooth; steering-wheel controls for audio and phone; and keyless start. The top SX versions add a power driver seat; a rear spoiler; a cooled glove box; 18-inch wheels; and a leather steering wheel and shifter trim. They also carry a base pricetag that sits just under $30,000. 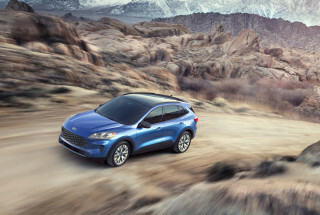 We've driven well-optioned vehicles that soared to more than $37,000--an astonishing number that's been equaled by the latest Escape in its top trim levels. Major options include navigation; leather upholstery; seat heaters; a cooled driver seat; and finally UVO, Kia's version of the Microsoft voice controller sold by Ford as SYNC. Kia's version has a more limited vocabulary and controls fewer functions, but it can search all your media to find the perfect soundtrack to your next drive, whether it lives on your iPod, an SD card, or HD Radio. UVO isn't available, however, when you specify the optional nav system--a running change is said to be in the works, and we'll update this review once we confirm the two systems can coexist in the same vehicle. The front-drive Sportage is among the most efficient small crossovers you can buy; just skip the all-wheel drive if you can. The Kia Sportage carries over its gas-mileage ratings from the year prior--impressive figures that give it at least competitive fuel economy with other popular crossovers in its size class. 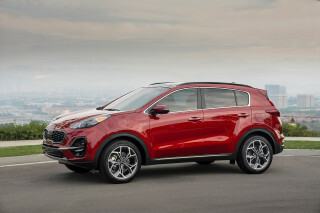 The Sportage's economy ratings are split among front- and all-wheel-drive models; those with manual and automatic transmissions; and between the models with 2.0-liter turbo and 2.4-liter four-cylinder engines. They have been restated since our initial review: that's because the 2013 Sportage is one of a set of vehicles found to have overstated fuel-economy numbers. The backstory: Kia initially submitted figures of 22/32 mpg (25 combined) with the 2.4-liter engine and up to 22/29 (24 combined) with the 2.0-liter. On a confirmation check of several vehicles, the EPA found the Sportage's actual tested fuel economy to be lower, with those figures (along with all the rest in the lineup) corrected to 21/20 mpg (25 combined) and 21/28 (24 combined), respectively. See the model-year details for all the other numbers. If you're affected by the change in ratings, you can register with Kia to receive reimbursement for the gas consumed above and beyond expected levels. More details are found at KiaMPGInfo.com. A solidly built, safe and reliable vehicle. I've owned several new vehicles in 50+ years of driving and find the Sportage the most reliable and trouble free vehicles that I have owned.